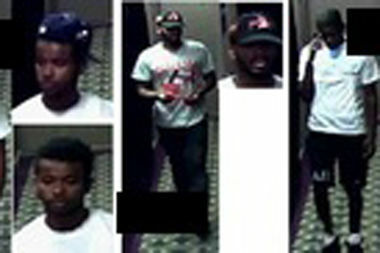 Police are looking for three men they say stole a man's Rolex after he invited them back to his Williamsburg apartment on Bedford Avenue and North 12th Street on August 14, 2016. BROOKLYN — Three men stole a Williamsburg man’s Rolex after he invited them back to his Bedford Avenue apartment, police said. The 34-year-old man met the three men at a nearby bar and then brought them to his apartment near Bedford Avenue and North 12th Street at about 2:30 a.m. on Aug. 14, an NYPD spokeswoman said. The 34-year-old eventually fell asleep and when he woke up the following day at noon he found the men were gone, as well as his Rolex worth $5,000, other jewelry worth $3,000 and his credit card. The men were later captured on surveillance cameras using his card to make $1,400 worth of purchases at stores in Harlem, including Ballers USA at 252 W. 125 Street. Anyone with information on any of these incidents can call the NYPD’s Crime Stoppers hotline at 1-800-577-TIPS.